When we think of political persecution, places such as Tiananmen Square may come to mind. Increasingly, however, this tool of tyranny is coming to our shores — and it is not made in China. It is, in the case I'll discuss today, made in Maricopa County. Every avid news reader knows about the battles between Maricopa County Sheriff Joe Arpaio and the federal government; Leviathan has targeted him because of his principled stand against illegal immigration. What is not quite as well known, however, is that the sheriff and his supporters — most notably, former Maricopa County Attorney Andrew Thomas — have long been battling a corrupt local political machine bent on thwarting the rule of law and benefitting itself. Not surprisingly, as in the film Walking Tall, Arpaio's and Thomas' attempt to end local corruption has come at a price: the State Bar of Arizona (SBA) has begun prosecuting Thomas and two of his deputies in a move that reeks of political retaliation. One of these underlings is ex-deputy county attorney Lisa Aubuchon. The other is ex-deputy county attorney Rachel Alexander, whom some readers may recognize as the proprietor of the website Intellectual Conservative. Alexander, despite having played only the smallest of roles in a racketeering case against the Maricopa County Supervisors, now faces suspension of her law license and significant career damage. And outrageously, Alexander's supervisor, Pete Spaw, has not been charged despite having played a far larger role in the RICO case. This has led many to conclude that Alexander is the victim of selective prosecution. Thomas came up with a unique way to prosecute illegal immigrants with a felony, instead of just letting them go with a slap on the wrist. He used a felony smuggling statute to prosecute them, describing them as "smuggling themselves." With a felony conviction, they would be required to serve time and would not be able to return to the U.S. He even distributed money — which was seized from racketeering funds — to programs for youth run by the Boy Scouts and churches. By law, that money is to be distributed to organizations that keep youth away from crime and drugs. Thomas ensured that it was no longer only distributed to left wing politically correct organizations. Due to the proactive efforts of Thomas, along with Joe Arpaio and Senator Russell Pearce, illegal immigration has greatly decreased in Arizona. The population of illegal immigrants dropped by one-third over two years. Thomas ran for re-election in 2008 on a platform of stamping out public corruption with Sheriff Joe Arpaio. Together they decided to take on powerful politicians who had gotten away with corrupt acts for years. Don Stapley, the Chairman of the County Supervisors, raised thousands of dollars to run for president of the National Association of Counties, even though he did not have an opponent. He then spent that money on personal luxury items. Stapley allegedly spent $6000 of these funds at Bang and Olufsen electronics, along with $1300 for hair implants, $400 for candleholders and $10,000 for furniture for his home. He also spent these funds, solicited as campaign money, to buy tickets to Broadway plays and movie theatres. He bought flowers, paid the grocery store and department stores, paid for massages — and paid for family trips to Sundance, to Utah to ski, a trip for his son and friends to Florida and a three-week vacation in Hawaii for his entire family at a beach house costing approximately $11,000. Thomas brought charges against Stapley and a jury indicted him. Stapley was also indicted for failing to disclose his real estate dealings on financial statements. His business partner, Conley Wolfswinkel, is a convicted felon. Thomas also brought charges against Supervisor Mary Rose Wilcox. She was indicted for voting on giving money to Chicanos por la Causa while failing to disclose she had a sweetheart loan deal from them. Wilcox, who drives a 2006 Corvette, gave herself prime real estate territory at Phoenix's Sky Harbor Airport through the "minority-owned business" affirmative action program. Unfortunately, though, the Maricopa Machine knows how to protect itself. These charges were all transferred to now retired judges — one of whom resigned in disgrace — and were dismissed. And the Machine plays dirty. At one point the supervisors removed Thomas' entire 30-lawyer Civil Division from his jurisdiction — until ultimately being ordered to return it by the Arizona Court of Appeals. At another point they allegedly hacked into Alexander's Intellectual Conservative website, cloaking it so that Google would block it; this severely impacted upon the site's traffic (the hacking damage has since been undone). As John Hawkins points out in his piece, when an expert (Hazard) who helped draft the American Bar Association's ethics rules says the SBA's charges are without merit, it should raise a red flag. Also sounding the alarm is the Maricopa County Republican Committee, which responded to the Machine's injustice by taking the unusual step of condemning the prosecution. 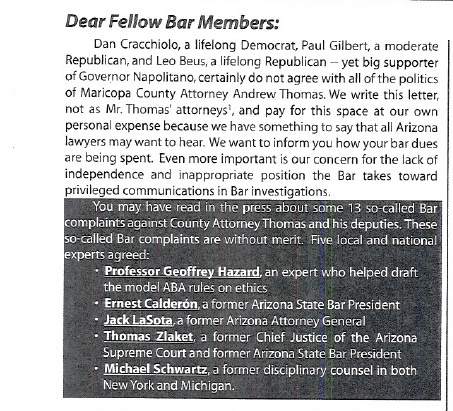 In a formal resolution, the MCRC pointed out that "even a columnist for the liberal Arizona Republic, Robert Robb, has denounced the Bar's investigation"; the MCRC concluded with, "NOW THEREFORE BE IT RESOLVED by the Maricopa County Republican Executive Guidance Committee that it demand the State Bar drop the baseless and politically motivated investigation into Andrew Thomas, Lisa Aubuchon and Rachel Alexander." Alexander is being charged, despite a long, unblemished record at MCAO [Maricopa County Attorney's Office], solely for her role working on the RICO case. What was her role? She worked under her supervisor Pete Spaw's direction. 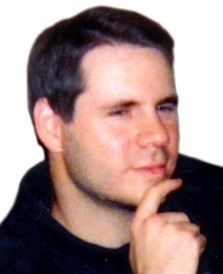 Shaw [sic] was an experienced RICO attorney who, according to my sources, started the drafts of the pleadings, finalized the drafts of the pleadings with Andrew Thomas, and developed the key theories in them. He exclusively dealt with opposing counsel, and filed all of the pleadings electronically. Alexander's role consisted of mostly research for the pleadings, and taking direction from Spaw, nothing further. Yet Spaw was not charged by the Bar, only Alexander. The real issue here is [an] allegation that Alexander sought to burden and embarrass county supervisors. The allegation is nothing short of hilarious on its face.... The supervisors, with a few exceptions, have done a pretty good job of bringing poor press and embarrassment upon themselves. And they did so all without the help of Alexander. Without a doubt, crooks are very "embarrassed" when light is shone on their dark deeds. Yet the ideological component cannot be overlooked. There is a full court press on to destroy Thomas, Aubuchon and a woman running a website named "Intellectual Conservative" for the same reason the Machine targets Sheriff Joe Arpaio: They were pursuing an agenda some call conservative but is really just the upholding of the rule of law — and the antithesis of liberalism. So this is a story of corruption. There is the garden variety, in which those who walk tall and stand against evil are targeted by those who wish to continue enriching themselves. But then there is the kind that is another hallmark of despotic regimes: political persecution. It is a phenomenon of fascism, whereby those who toe your line get benefits, and those who don't get intimidated into silence or, when they're too stout-hearted, destroyed. Then, once big business and all other prominent people and entities are marching in lock-step, you have complete control over civilization. This is Chicago — and, it appears, Maricopa — politics. And we allow it to stand at our own peril.